Looking for a source for Aztek Brake Lines and Brake Line Kits. Searched here and did not find any topic. Tried SStubes .com and they don't seem to have them. Also, are they same for Aztek as Buick Rendezvous? Are you trying to buy the flex hoses going to each wheel, or the hard lines from the master cylinder? 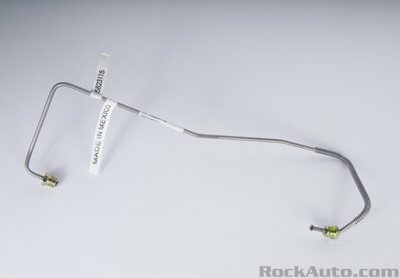 If you are looking for the brake lines / hoses to the drums etc rock auto has them listed under hydraulic hoses. How do you make sure the part is interchangeable? Is there a list somewhere? The hard brake lines for the front are going to be the same inbetween the 2 platforms. However, I am fairly positive that they are not interchangeable for the rear. The Rendezvous is 4 inchs longer, so the brake lines would also be about 4 inchs longer. I would suggest finding a salvage yard, and pulling them from a donor vehicle. Preferably from the southern regions, or Colorado, as they wont be rusty, and the fitting should release from the terminals easier. If anyone comes back to this it appears the Aztek and Rendezvous uses the same brake lines as long as you're comparing FWD to FWD and AWD to AWD. I found lines at SStubes.com for AWD Teks. Believe I will be ordering a set this weekend for my new ride.